“My great-grandfather was well-known in the onion trade. He was one of the famous Onion Johnnies, the farmers from north Finistère who set off for England on bicycles to sell their strings of onions. The English loved buying their onions in this way and eagerly awaited the arrival of the Johnnies and their special French onions. 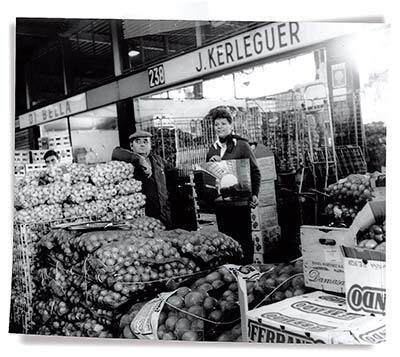 In 1946, his daughter married Joseph Kerléguer,a successful onion and garlic wholesaler who ran his business with his mother at the famous old Paris market, Les Halles, near Saint-Eustache. The couple – my grandparents – took over the business and ran it for more than forty years. Under their management, the family business grew, employees were hired, sales methods were organised and they earned a fine reputation for their quality products. In 1982, their daughter – Marie-José Kerléguer – took over the reins after working in a range of jobs in the company for more than ten years. Throughout her career, my mother worked hard to expand the range of products, increasing sales by developing a loyal customer base and offering a choice of high quality products, as her parents had done before her.